Wireless for the Warrior. Additions Supplement No. 1. The transistor power supply for Wireless Set No. 62 (Cat No. Z1/5820-99-102-2776) is a direct replacement for the rotary transformer power unit which is normally issued with the standard equipment. It operates on 12 V DC and results in a considerable reduction in battery consumption. Year of introduction was about 1963. Around 1965 the stocks of the rotary transformer unit were wasted out and Power Supply Transistorised No. 36 was issued in lieu. Sets fitted with the new transistor power supply unit were marked in red lettering "TRANSISTORISED P.S.U." in a space left above the front panel meter. The complete unit is housed in a ventilated metal case with the same overall dimensions as those of the rotary transformer power unit. When installed it is bolted directly to the chassis for the No. 62 Set, the two securing screws being provided with adapter washers to replace the rubber grommets on which the rotary transformer power unit is mounted. Differences in current consumption Wireless Set No. 62. The unit operates from 12V DC and uses two transistors type OC35 in a conventional push-pull DC converter circuit with saturable transformer coil switching. Diode MR1 provides protection for the transistors if the supply is connected in the wrong polarity. 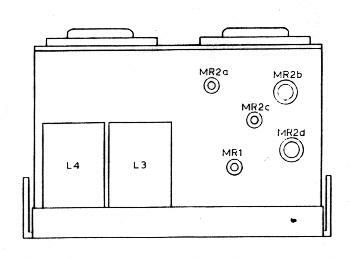 The frequency of operation of the converter is approximately 1.5kHz. 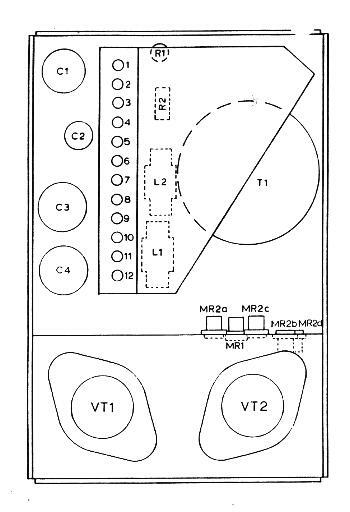 Transistor Power Supply Unit general construction and component layout.